Alev Çınar is Professor of the Department of Political Science and Public Administration at Bilkent University, Turkey. She received her M.A. in Sociology from Bogazici University; Ph.D. in Political Science from the University of Pennsylvania, and completed two postdoctoral fellowships at the International Center for Advanced Studies, New York University, and the Five College Women's Studies Research Center, University of Massachusetts at Amherst. 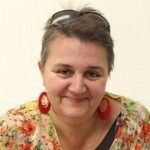 She is the author of Modernity, Islam and Secularism in Turkey: Bodies Places and Time; co-editor of Urban Imaginaries: Locating the Modern City, and of Visualizing Secularism and Religion: Egypt, Lebanon, Turkey, India. She also has articles that have appeared in journals such as the Comparative Studies in Society and History, International Journal of Middle East Studies, Theory, Culture and Society, and Signs: Journal of Women in Culture and Society. She is currently serving on the Editorial Board of the International Journal of Middle East Studies. Çınar has also taught at the University of Massachusetts at Amherst as a Ford Associate; and at Bryn Mawr College as a Fulbright Visiting Specialist. She has received various prestigious awards and grants from different institutions including Fulbright, Ford Foundation, Social Science Research Council, Mellon Foundation, United States Institute of Peace, and received a Distinguished Teacher Award from Bilkent University in 2008. Dr. Çınar became a member of the School of Social Sciences at the Institute for Advanced Study in 2012-13, which is one of the most prestigious academic institutions in the world. She was the first and the only social scientist to become a member at the Institute representing a university in Turkey.